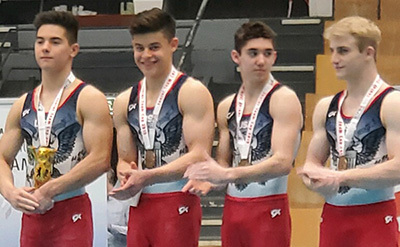 BERLIN, April 5, 2019 – The USA edged out Russia to win the team gold medal at the 2019 International Junior Team Cup at Berlin’s Large Sports Hall of the Sportforum. Isaiah Drake of Van Nuys, Calif./Gymnastics Olympica, and J.R. Chou of Cypress, Texas/Cypress Academy of Gymnastics, won the all-around silver and bronze medals, respectively. Competition concludes tomorrow with individual event finals at 2 p.m. Berlin time, which is six hours ahead of U.S. eastern time. Team USA posted a six-event total of 238.950 to bring home the team gold medal. Russia was right on the Americans’ heels at 238.450. The U.S. team’s event scores were: floor exercise, 40.600; pommel horse, 38.700; still rings, 40.200; vault, 42.600; parallel bars, 38.450; and horizontal bar, 38.400. Italy claimed the bronze at 234.500. The members of the four-man team are Fuzzy Benas of Richmond, Texas/Enrich Gymnastics, Colt Walker of Cedar Park, Texas/AcroTex Gymnastics, Chou and Drake. In the team competition, 38 teams from 26 countries competed. In the all-around, Drake tallied a 79.800, just 0.25 behind Brazil’s Diogo Soares' 80.050. Chou earned a 79.000 and the bronze. All four of the U.S. gymnasts finished in the top 10, with Benas in 7th place (78.200) and Walker in ninth (77.900). The U.S. gymnasts’ individual event scores were the following. Drake: floor exercise, 13.250; pommel horse, 13.300; still rings, 13.450; vault, 13.650; parallel bars, 13.050; and horizontal bar, 13.100. Chou: floor exercise, 13.500; pommel horse, 13.550; still rings, 12.800; vault, 13.900; parallel bars, 12.850; and horizontal bar, 12.400. Benas: floor exercise, 13.500; pommel horse, 11.400; still rings, 13.500; vault, 14.650; parallel bars,12.550; and horizontal bar, 12.600. 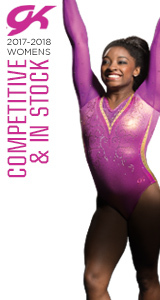 Walker: floor exercise, 13.600; pommel horse, 11.850; still rings, 13.250; vault, 14.050; parallel bars, 12.450; and horizontal bar, 12.700. Live scoring and more information are available on the official website.